Jesuit communities across Australia and around the world gathered to celebrate the feast of the Jesuit founder on 31 July. Australian Jesuit Provincial Fr Brian McCoy SJ celebrated Mass for the Feast of St Ignatius at Jesuit Social Services on the morning of the feast day. Fr Brian McCoy SJ and Jesuit Social Services CEO Julie Edwards lead feast day celebrations in Melbourne. He spoke about how Ignatius discovered and shared a way of discerning what God was asking of him, a legacy that has been passed down to the Society of Jesus today. ‘We will always be considering what God calls of me now, what God calls of each of us now, knowing that our lives are in God’s hands, but we are in the hands of one another’, he said. Staff from Newman College, Jesuit College of Spirituality and Jesuit Communications also joined in the Mass and morning tea at the Jesuit Social Services offices. Other ministries also celebrated the feast day in their own way. The community at St Canice’s in Sydney was joined by students from St Ignatius’ College Riverview and Loyola Senior High School in Mt Druitt for their feast day Mass on Sunday, with Fr Frank Brennan SJ preaching the homily (available in full here). Each of the Jesuit schools held their own feast day celebrations, which included sausage sizzles and faith and service events. Staff at the Province Office in Hawthorn were joined by some Jesuit Mission volunteers for their feast day Mass and lunch. Meanwhile, Jesuits in Melbourne and Sydney came together in the evening for Mass and celebration, while other Jesuits celebrated in their home communities. Jesuit Social Services marked the feast day by launching its new Foundation Document. The document outlines how the work of Jesuit Social Services grows from the mission of the Jesuits, with its focus on seeking what matters, on finding God in all events and people, and on faith and justice. Launching the document, Jesuit Social Services CEO Julie Edwards said the organisation had spent much time looking into the roots of the organisation’s work; not just to preserve that heritage ‘but actually animating it and bringing it to life in all that we do’, she said. The document also puts forward the organisation’s Practice Framework. 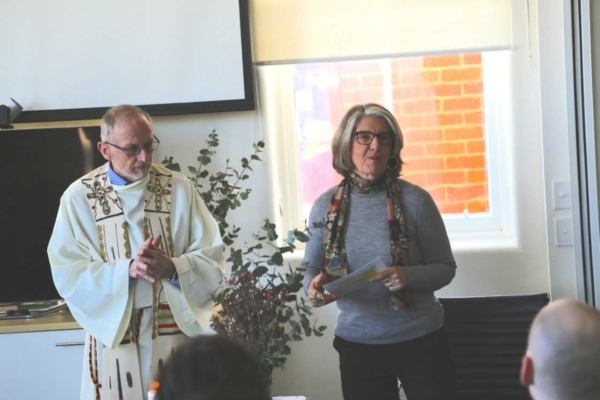 Julie Boffa, a Jesuit Social Services staff member, said the framework aims to help staff embed the practices of Jesuit Social Services into their way of working. The five key domains of the framework are valuing self, affirming goals and aspirations, linking to supports, using skills and building capacity, and enhancing civic participation. ‘One way that we make sure [Jesuit Social Services staff] keep coming into contact with these different domains, and what it means for their work, is that we embed within our agency database … these outcomes’, she said. Jesuit Asia Pacific Conference President Fr Tony Moreno’s message on the feast day sought to remind people that at the heart of Ignatius’ life was God. He said at the recent assembly of major superiors in Nagasaki, Japan, the Jesuits reflected on some of the complex religious, social, political, economic and ecological issues in the Asia Pacific. ‘Like Ignatius, the Jesuits and our mission partners of today are called to collaborate with the Lord in his mission. May Ignatius’ spirit of magnanimity of heart, humility and familiarity with God inspire us in everything we do to love and serve’, he said. Jesuit schools around the world also came together to celebrate Ignatius. In a video for Educate Magis, schools from South Asia and the Asia Pacific region came together to share their wishes for the feast day. 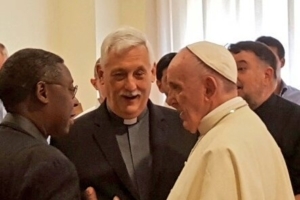 Meanwhile, in Rome, Pope Francis joined the Jesuits at the Curia to celebrate the feast day.